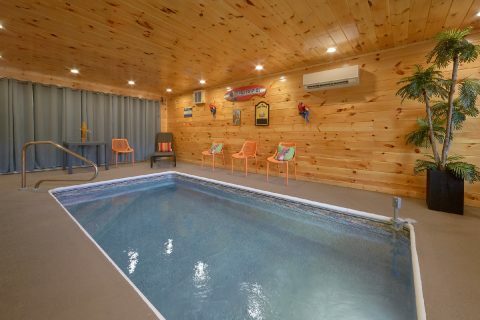 Located less than 5 miles from the exciting attractions of Downtown Pigeon Forge, you'll find "Swimming Hole," a luxury 2 bedroom cabin with a private indoor pool! 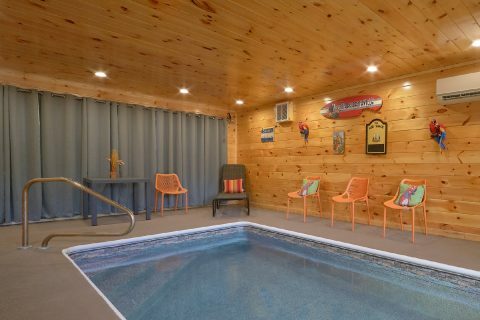 Not only does "Swimming Hole" offer a heated indoor pool that provides year-round swimming, but this rental also offers a beautiful location that's close to everything you want to do and see. 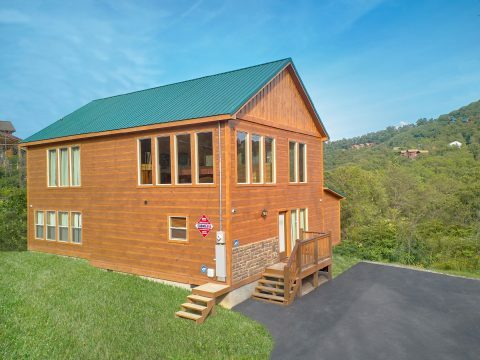 From this cabin's lovely spot with a gorgeous mountain view, guests can easily reach top attractions in Pigeon Forge like Dollywood, The Island, and The Titanic Museum. 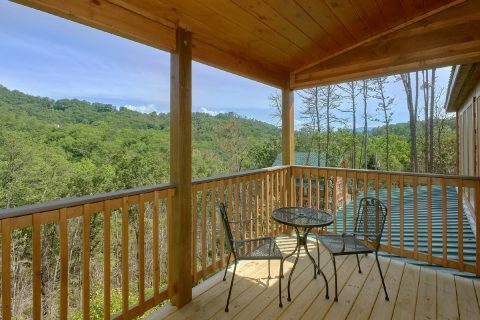 Additionally, Downtown Gatlinburg and several entrances to the Great Smoky Mountains National Park are only a short drive away as well. 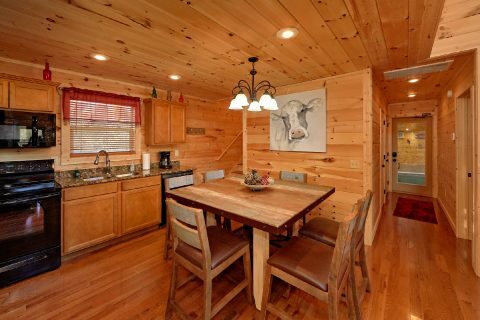 Once you return to your luxurious cabin in the mountains, you'll be glad you reserved a 5-star cabin for your stay. 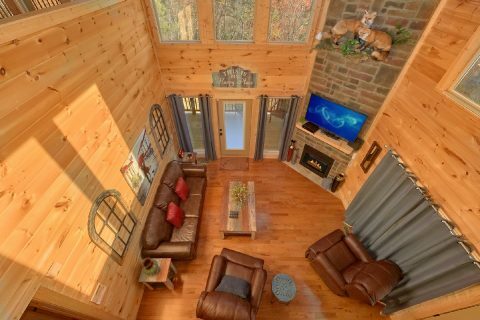 On your cabin's main level, you'll enjoy a comfortable living room area with vaulted ceilings that boasts a floor-to-ceiling stone gas fireplace, sofa, a 4K 55" 2160 p HD smart television with a DVD player, and comfortable furnishings. 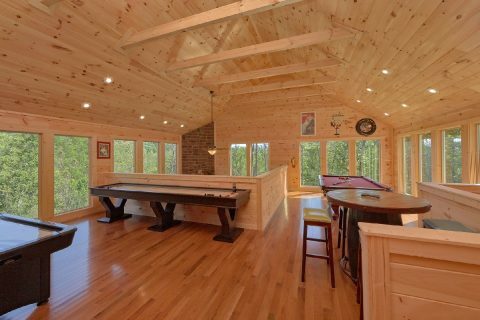 Nearby, you'll find your cabin's indoor swimming pool area with access to the deck that boasts an excellent view. 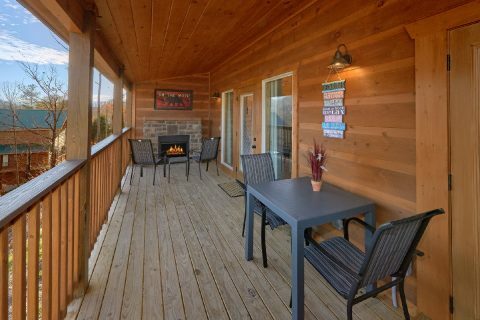 To enjoy the fresh mountain air, simply step outside to take a soothing dip in the warm waters of the hot tub or simply relax by the outdoor gas fireplace while you kick back on a stylish chaise lounge. 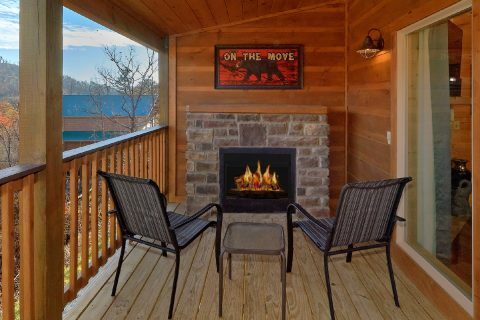 This deck even comes complete with a table and chairs so you can enjoy your morning coffee surrounded by the sights and sounds of nature. 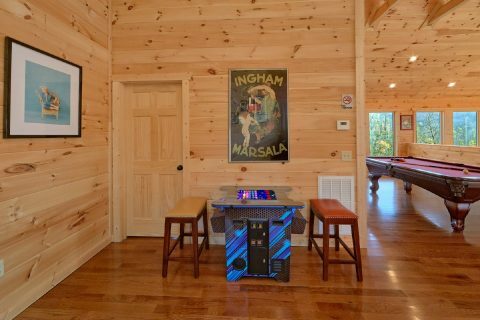 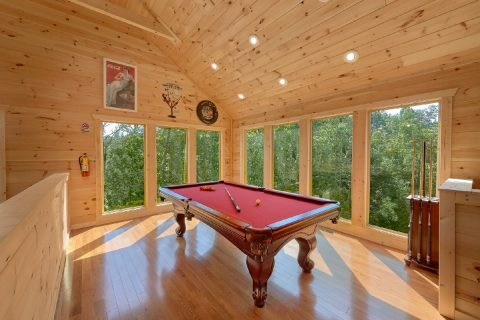 For some fun and friendly competition, you can head upstairs to your cabin's game room loft that comes with an 8-ft pool table, air hockey, a 12-ft shuffleboard, and a 64-game multi-cade arcade game. 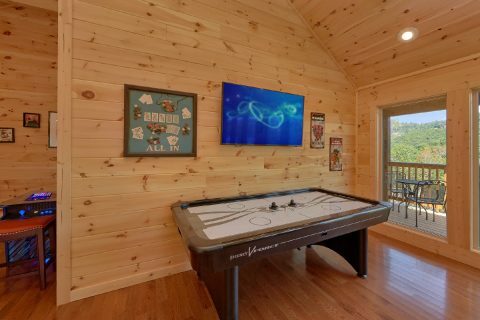 The game room also comes with a 55" 4K 2160 p HD television, a pub table, and stools, so you can watch the big game while you play a round of billiards. 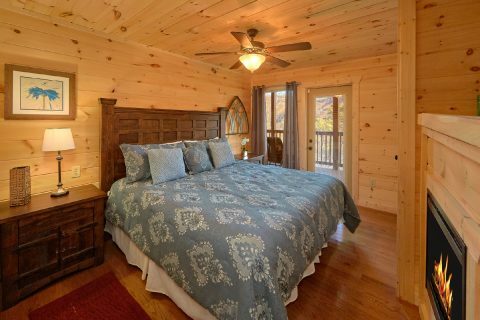 After a great day spent riding roller coasters at Dollywood or hiking the beautiful trails of the national park, you can look forward to getting a great night's rest in your comfortable cabin. 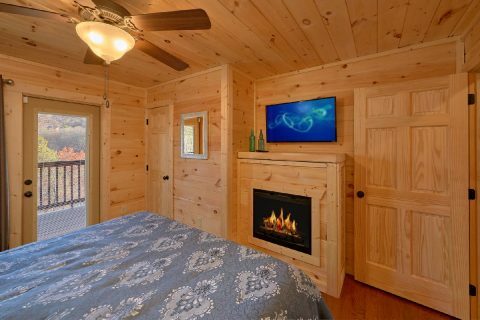 The main level has 1 bedroom with a king bed, a cozy electric fireplace, and a 43" television. 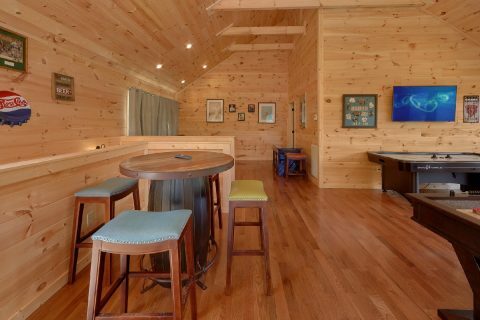 Upstairs, you'll find another king bedroom that provides a king bed, a 43" television, an electric fireplace, and access to a private balcony with a table and chairs. 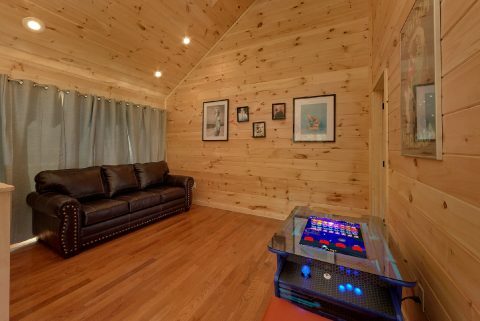 With a queen-size sleeper sofa in the game room loft, "Swimming Hole" can easily sleep up to 6 guests in comfort. 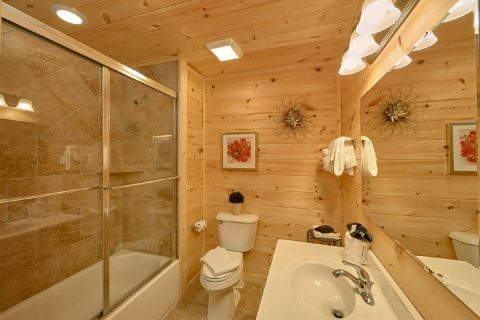 Both of this cabin's two bathrooms come complete with luxurious, dual-head showers for you to enjoy during your stay. 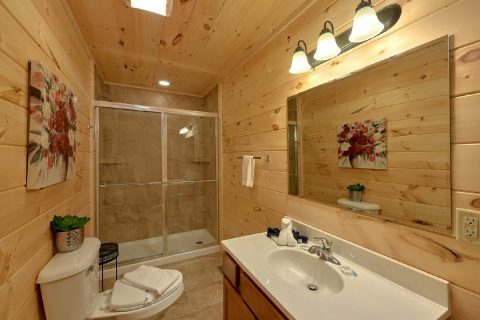 One bathroom is located on the main level, while the other bathroom is located in the upstairs master bedroom. 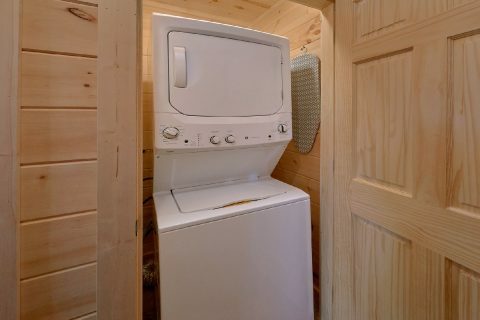 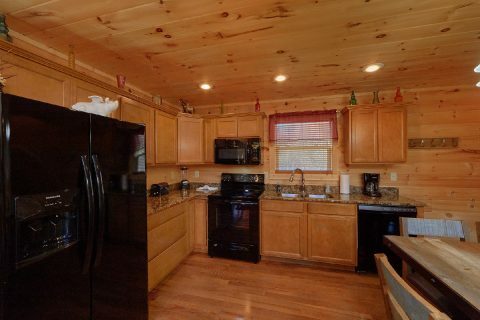 Lastly, this cabin provides practical amenities like a full kitchen and a washer/dryer for you to use during your getaway in Pigeon Forge. 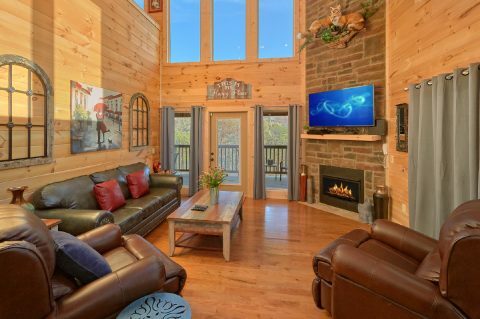 Reserve your own "Swimming Hole" in the Smokies to start planning a cabin getaway complete with an indoor swimming pool and an unforgettable mountain view. 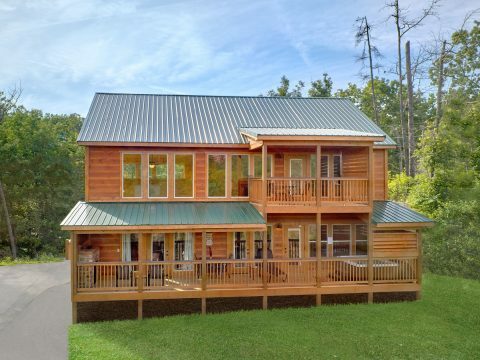 Best of all, you can reserve this premium cabin online with Cabins USA to save 15% on your nightly rate in the Great Smoky Mountains of Tennessee!